The functional and indestructible T&K.A-firewood–shelter constructed from galvanized steel tubes is available in two standard sizes, and can be expanded continuously due to its modular design. The standard sizes (outer dimensions) are 1810 x 700 mm (WxD) and 1260 x 700 mm (WxD) always with a height of approx. 1800 mm. The small module can store approx. 1.5 m3 of firewood and the large module approx. 2.2 m3. The wood is protected from rain by a robust and water resistant bitumen corrugated sheet roof. The side frames are made of 40/40 mm square tubes with welded double bar panel. The platform consists of a welded frame and double bar panel. 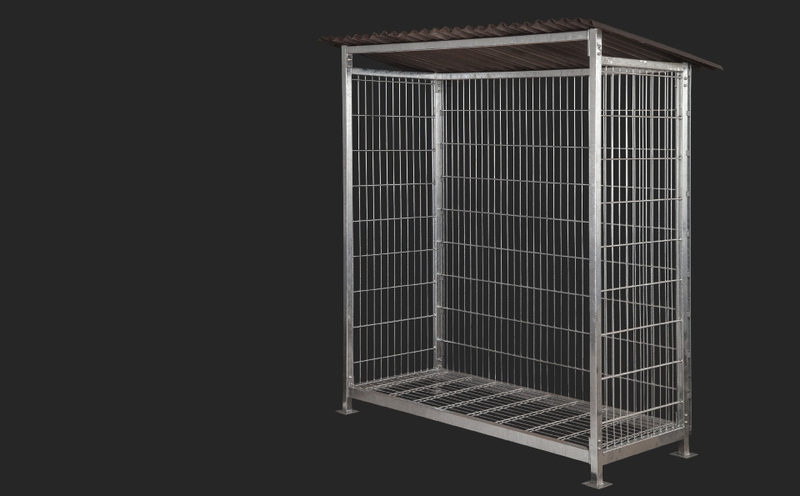 Platform and struts are available in two different lengths, so there are many ways to customize the shelter. All in all it is an easy to assemble solution since all parts are screwable and all items are hot dip galvanized against corrosion. Accessories and installation instructions are included in the delivery. The T&K.A firewood-shelter has a total height of 2000 mm.